"...They are an exciting ensemble that has a great future and will delight audiences of every age and background..."
"Alkali gave a powerful performance infused with raw emotion and an infectious energy..."
A fiery combination of string players/composers, ALKALI crosses cultural divides, defies genre labels, and exhilarates audiences across the nation. Their original compositions and covers are infused with styles ranging from jazz to classical to pop, and their uniquely powerful acoustic string sound has set them apart in the music world. 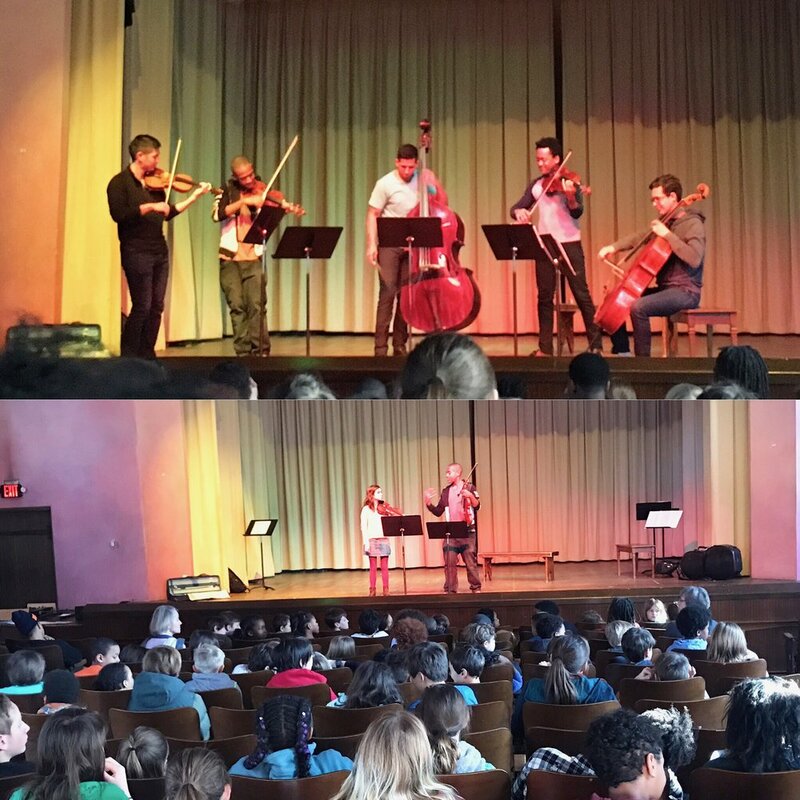 Comprised of Andy Liang and Josh Henderson (violins), Andrew Griffin (viola), Scott McCreary (cello), and Nick Villalobos (bass), the dynamic ensemble formed from the mutual vision of a group of string players that could bring virtuosic classical flair to different genres of music. ALKALI soon developed an enthusiastic following, performing shows from New York to Houston to the islands of the Dutch Caribbean. Collaborations have also led them alongside various acclaimed artists including Outlawz and Backyard Band. Members of Alkali are graduates from Yale University and Rice University among others, and are laureates of several national and international competitions including the Sphinx Competition and Washington International Competition for Strings. ALKALI's first self-titled album is now available on all music media platforms including Amazon, Spotify, Apple Music, Tidal, and Google Play. ALKALI's vision is to excite, inspire, and electrify audiences of all kinds through the versatility of string instruments. We infuse our personal influences of jazz, classical, hip hop, and pop into a uniquely acoustic string sound that ultimately defines its own genre. CREATIVITY: Alkali is one of the only classically based ensembles that primarily composes and arranges its own music. COLLABORATION: Alkali continues to collaborate with a wide range of artists including rap artists, vocalists, orchestras, visual artists, dancers, and theater among others. DIVERSITY: Alkali believes strongly in the importance of diversity in music and strives to reflect the wide range of music that characterize its personnel. COMMUNITY: Alkali understands the power and importance of music and art for all in our society. The group has taught masterclasses from elementary school up to the collegiate level, and has performed concerts for rehabilitation clinics and prisons. Alkali has performed at a diverse array of venues including concert halls, universities, schools, clubs, and various events throughout the country and internationally.